a lodged corn kernel from your teeth. When you go to the restroom to examine your mouth further, you notice some bleeding along the gum line. This is a sign that it’s time to visit your dentist for an examination to make sure you don’t have gum disease. Gum disease (also known as periodontal disease) is an infection of the tissues surrounding and supporting your teeth. It’s a major culprit for tooth loss in adults, sometimes going undiagnosed because it is painless. A common condition, 47.2% of American adults suffer from some stage of this disease. There are few signs to pay attention to like red, swollen, tender, easily bleeding gums. Other signs are gums that have pulled away from the teeth. You may also experience persistent bad breath, a foul taste in your mouth, or permanent teeth that are loose or separating. If you notice any of these warning signs, make sure to schedule a visit with your dentist. 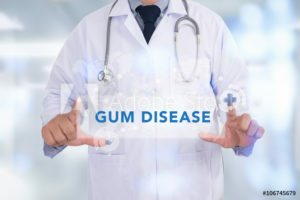 Lack of Oral Hygiene – Gum disease is most commonly caused by plaque, which is a thick film of bacteria that forms on gums and teeth that daily brushing, flossing and rinsing removes. Smoking – Smoking hinders the normal function of your gum tissue cells, leaving your mouth more vulnerable to infections like gum disease. Hormonal Shifts – For women, pregnancy and menstrual cycles can cause hormonal shifts. Expecting mothers are at risk because the gestating baby gets nutrients first, sometimes leaving the mother with less than normal levels of certain vitamins and minerals, which can make her more susceptible to gum disease and infection. Medication – Certain medications can reduce your natural saliva production and flow, leaving a dry mouth. This creates a more comfortable environment for harmful bacteria to grow and spread. Nutritional Deficiencies – A diet devoid of such nutrients as vitamin C leaves your gums vulnerable. Also, excess sugar and carbohydrate consumption can aide in gum problems. Crooked Teeth – Misaligned teeth are harder to clean properly, which can allow harmful bacteria to linger and fester, eventually causing gum problems. Family History – Your genetics can play a role, too. If you have a history of gum disease in your family, your dentist needs to know. If caught early, gum disease is usually reversible. It is important to pay attention to your mouth while brushing and to not hesitate to schedule a visit with your dentist if you notice any persistent gum bleeding. And as always, regular teeth cleaning, along with brushing and flossing at least twice daily, are the best ways to prevent gum disease. With over 17 years of experience in cosmetic and implant dentistry, Neil Flenniken, DDS, FAGD, AFAAID received his Bachelor of Nutrition from Ohio State University and his DDS from Howard University. He is also a graduate of the Las Vegas Institute for Advanced Dental Studies. He practices at Flenniken Family Dentistry. For more information about his services, you may contact him at his website.